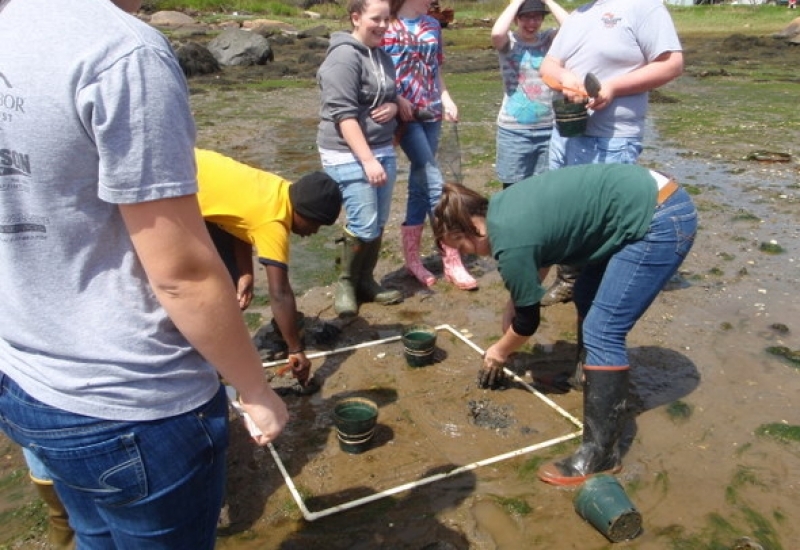 DEI assists classes and schools in conducting intertidal field experiments in their own communities, utilizing the intertidal area to investigate the survival and growth of soft-shell clams. 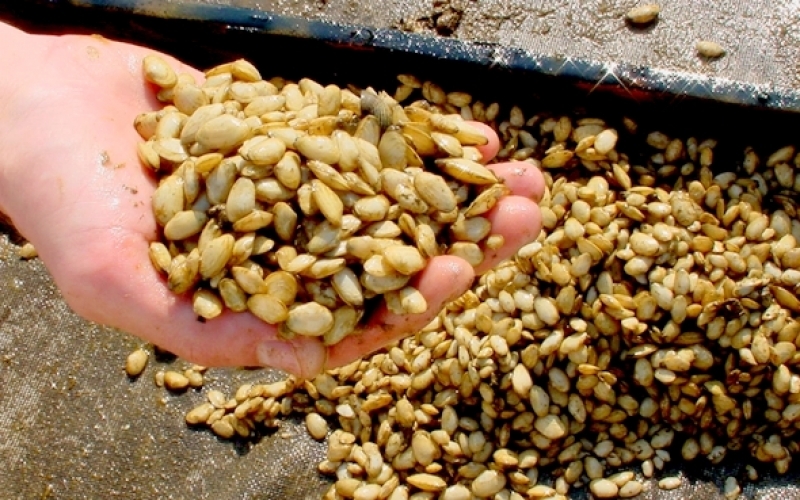 Because these experiments are performed with strict adherence to scientific principles, the data collected is of a quality that can be used by town Shellfish Committees to manage local soft-shell clam resources. 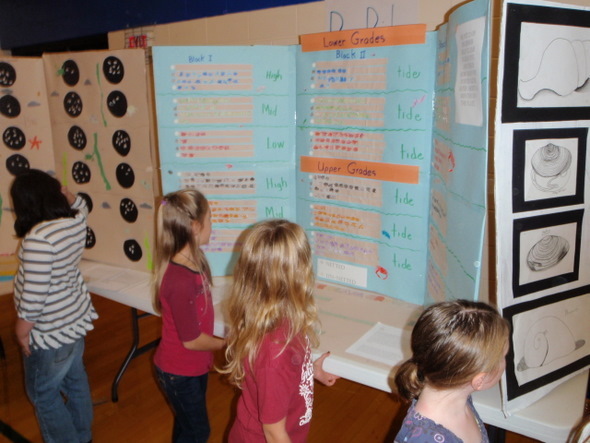 Over the past five years, DEI has overseen season-long field research projects at eleven different schools stretching from Portland to Cutler. 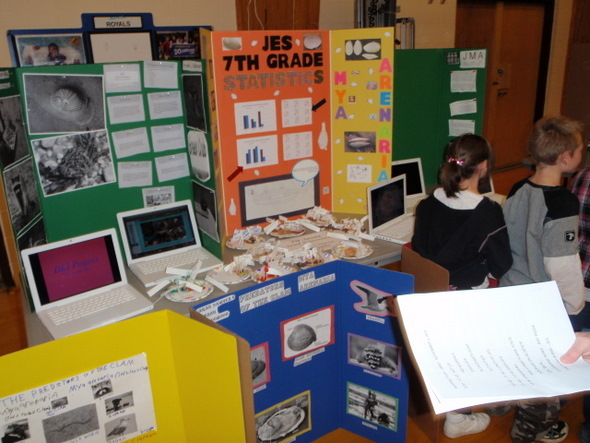 Results from the field experiments have been presented at marine trade shows, town meetings, and other venues. 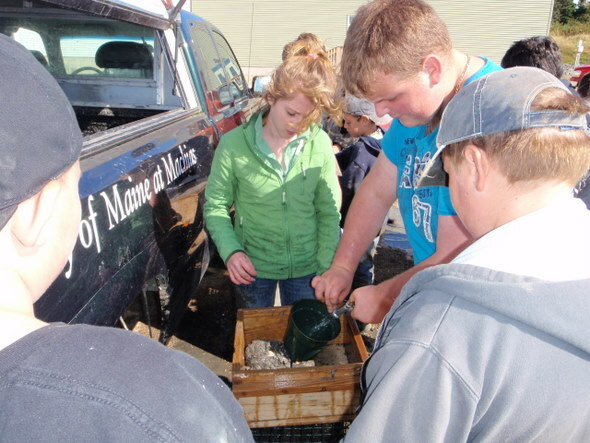 For example, in 2018, Searsport High School presented at the Maine Fishermen’s Forum the results from their 2017 study that measured shellfish productivity and green crab recruitment in three coves in Searsport and Stockton Springs. 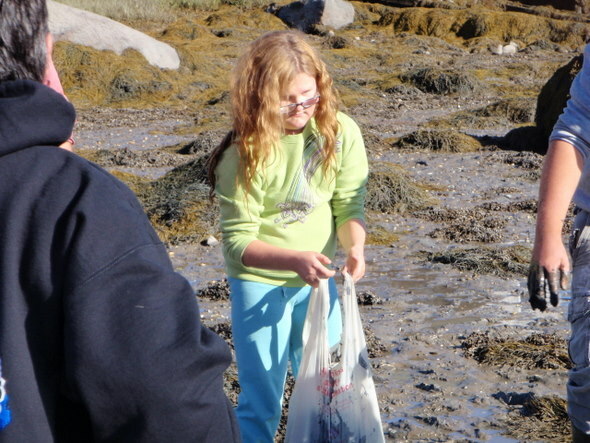 In 2018, DEI began a collaboration with several Maine environmental-based non-profits to increase knowledge of current clam recruitment across Maine’s coast by using simple testing methods developed by DEI. 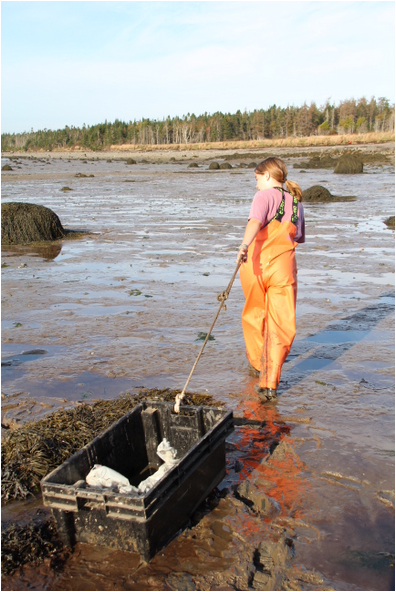 Like the other place-based intertidal research DEI conducts, CSI – Maine also assists municipal shellfish programs to be aware of the relative rates of clam recruitment, growth, or predation across the coastline they manage. The information acquired through this educational collaboration using an experimental approach to data collection can assist communities in deciding where and how best to take protective action against predators. 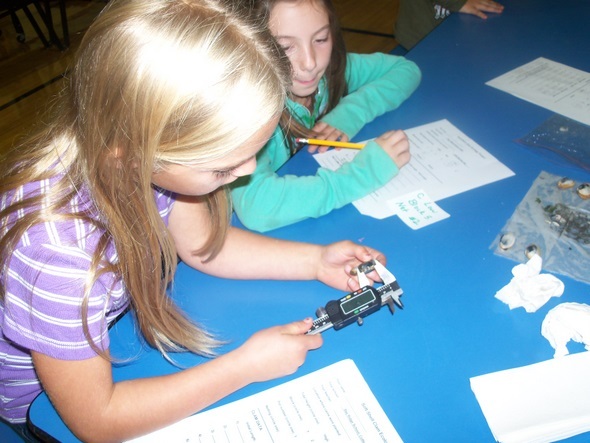 It involved students from the Bay Ridge Elementary School in Cutler, Washington Academy in East Machias, Jonesport Elementary, Beals Elementary, and Jonesport-Beals High School. 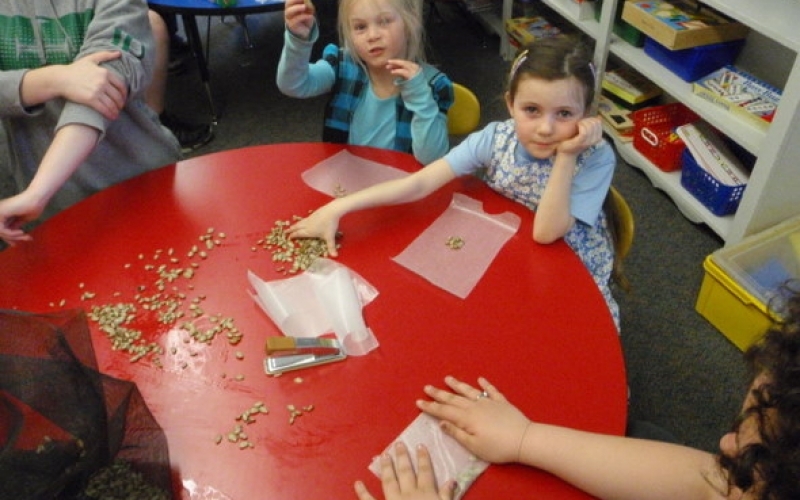 A total of 250 students and 17 teachers participated in the project. 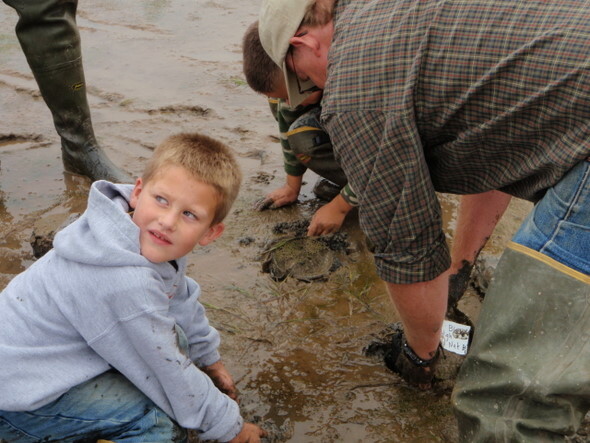 How do predators affect the growth and survival of juvenile soft-shell clams planted at three different tidal heights on mud flats in each community? To answer the question, we devised a comparative field experiment. Here are the steps we used to set up the experiment at Little Machias Bay (Cutler), Rim River Bridge – Machias River (East Machias), Flake Point Bar (Jonesport), and Cranberry Cove (Beals). Click here to see this presentation as a PDF. 1) We used cultured soft-shell clam (Mya arenaria) seedlings reared in 2010 at DEI and overwintered at DEI that were about 12 mm (or 1/2-inch in length). 2) The clams were carefully counted out in groups of 12 to be planted on each flat at a density of 660/m2, or about 60/ft2. 3) Plastic mesh netting (1/4-inch aperture) was cut for two purposes. First, 18-inch x 18-inch pieces were manufactured as predator-deterrent nets. 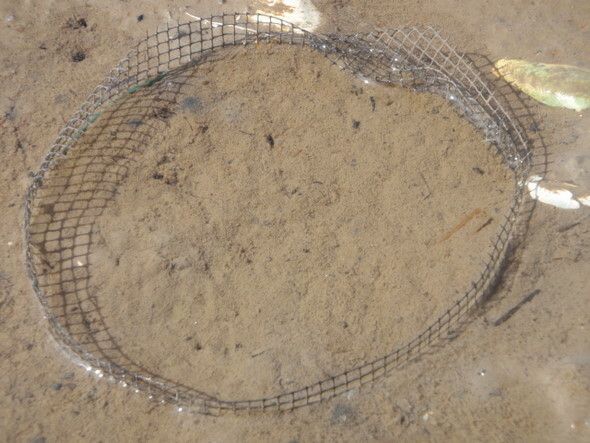 Second, 30-inch x 6-inch strips of netting were produced to serve as fences to corral clams in a small space. 4) This is a close-up of a six-inch plant pot, it is not an ash bucket. The strips of netting were secured around the top of a 6-inch plant pot. This pot was filled with sediments and placed into the mud with a small part of the lip and netting extended above the sediment surface. 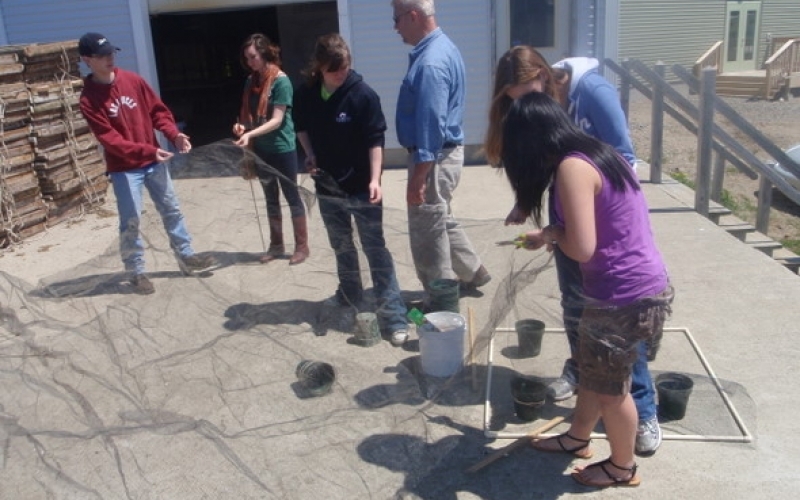 The netting creates an “open enclosure” or corral for the planted clams. 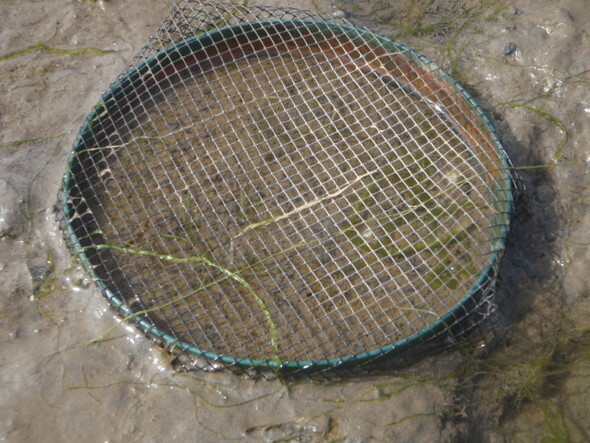 Clams can move laterally in the sediment, but if they encounter a barrier such as the netting, they cannot jump out, so the netting is a device to keep them corralled inside the plant pot (experimental unit) area. The netting strips do not deter predators. 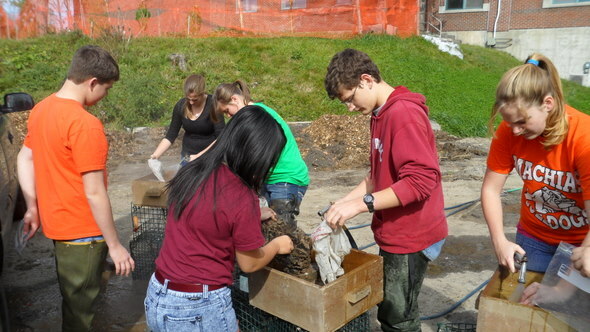 5) The plant pots, clams, and netting were taken to the flat where the pots were dug into the mud using trowels. The white square is a 1-m2quadrat that was used temporarily to help us place four pots near each other in a common group. The sediment was dug with the trowels, and one pot placed into the hole within each of the four quadrants of the quadrat. 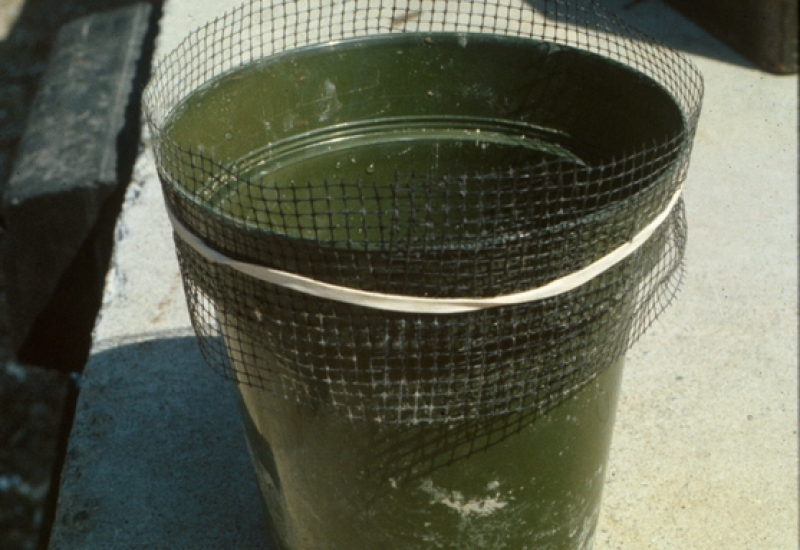 Two pots were those with the strips of netting secured around the outside edge of the pot, and two pots were those completely encased in the 1/4-inch netting to deter predators. 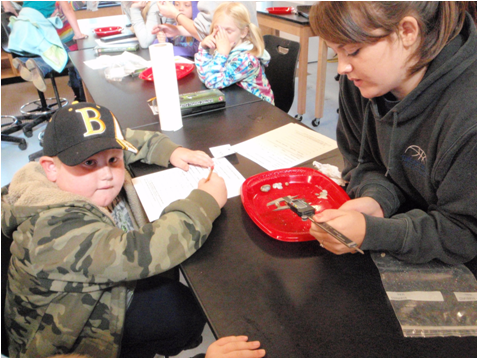 6) Clams that were counted and put into wax paper packets were carefully placed into the pots filled with sediments from the mudflat. Twelve clams were seeded in every pot. 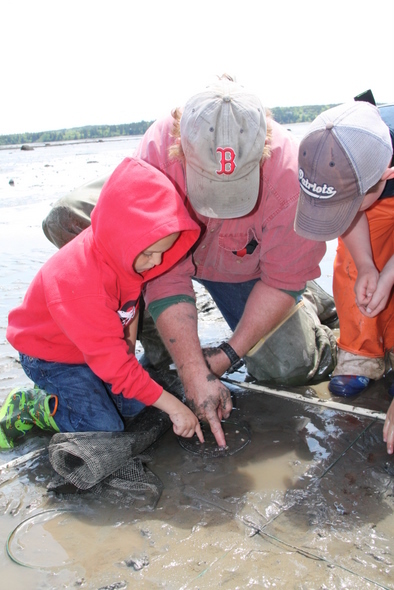 A gentle push with your finger helps the clams to burrow into the sediments more quickly. 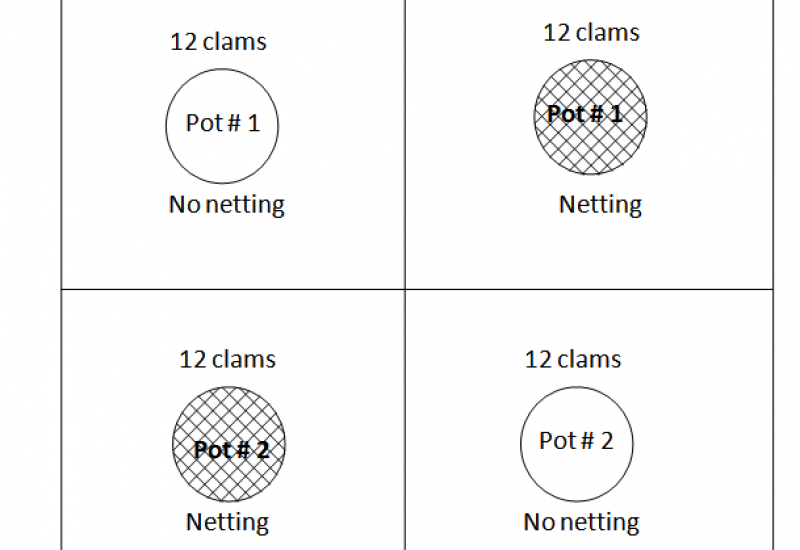 7) (image on left) An 18-inch x 18-inch piece of netting was placed over a pot with 12 clams, and then the pot and clams were pushed into the mud. (image on right) A few days after planting, the “open pots” looked like this. You can see evidence of the small clams from some of the larger holes in the mudflat surface inside the pot. 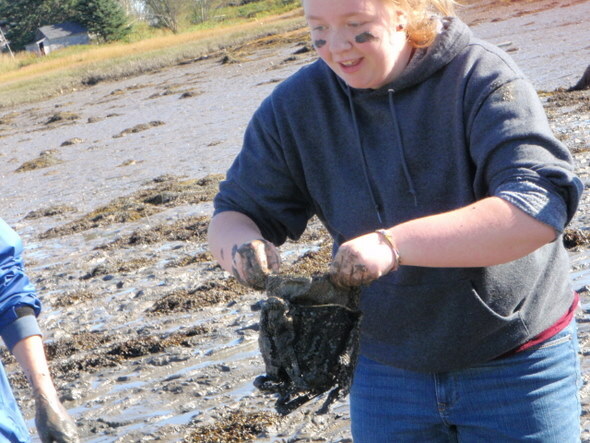 Clams will stick their siphons up through the mud into the overlying water when the tide is over them so that they can feed on the microscopic plants (phytoplankton) that are in the water. 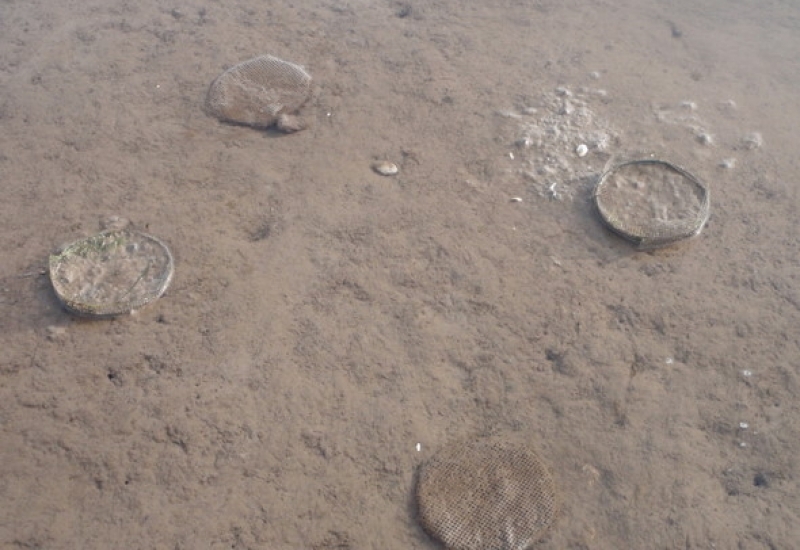 This is what each group of four pots would have looked like if you happened to be walking on the mudflat. This is a schematic of the field layout used at Flake Point Bar in Jonesport. 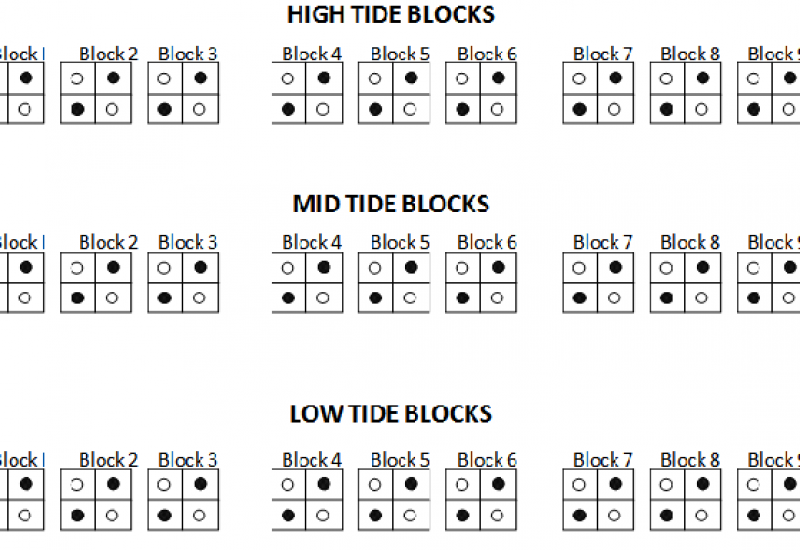 A total of 36 pots with 12 clams each were positioned at each of the three tidal heights. The black circles represent pots with the full pieces of mesh netting, and the open circles represent pots with only the strips of netting around the periphery. 8) The experiment at each of the four locations was initiated in late May/early June 2011 and remained in the field until late September/early October 2011. This is a group of four experimental plant pots at Flake Point Bar (Jonesport, ME) in mid-September 2011, a few days prior to pulling them out to learn about the results. 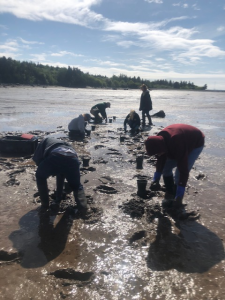 9) All pots from the four mudflats received a label designating the location of the flat, the treatment (netting vs. no netting), the tidal height (High, Mid, or Low), the group (or block) number, and the treatment replicate within the group (i.e., #1 or #2 for netted or unnetted pot). 10) Each pot was placed into its own plastic bag and carried off the flat. Each mud-filled pot (sample) weighed about 10 pounds. Each was carried off the flat to be processed. 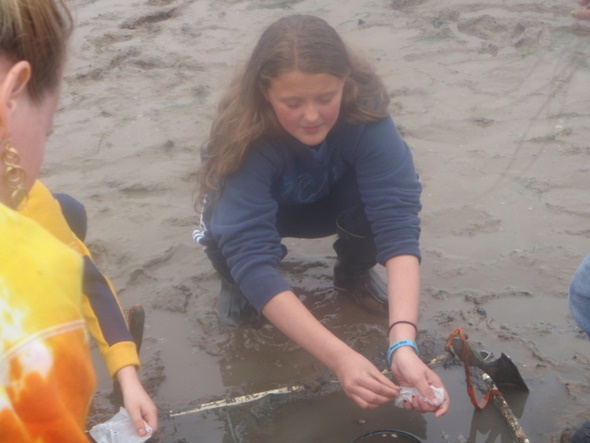 11) Processing entailed placing the contents of each pot separately into a box sieve (2 mm mesh) and spraying the mud through the mesh with freshwater exposing the clams, broken pieces of clam shells, and other mudflat fauna. All live clams and all broken pieces from each sample were carefully removed for counting and measuring. Some samples revealed that green crabs (Carcinus maenas) or moon snails (Euspira heros), well-known clam predators, had preyed on clams — sometimes in pots with clams that had been “protected” with a piece of predator-deterrent netting. (Above) The clam on the left has been consumed by a green crab, whereas the clams on the right have been drilled and eaten by moon snails. (Below) Live, hatchery-reared clams lay down a disturbance line in their shells at the moment when they begin growing in sediments. 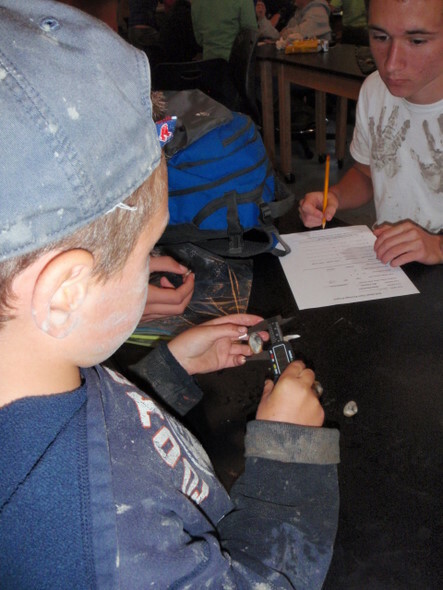 Students took two measurements on each live clam using digital calipers — the initial shell length in May/June and the final shell length at the end of the study (September/October). 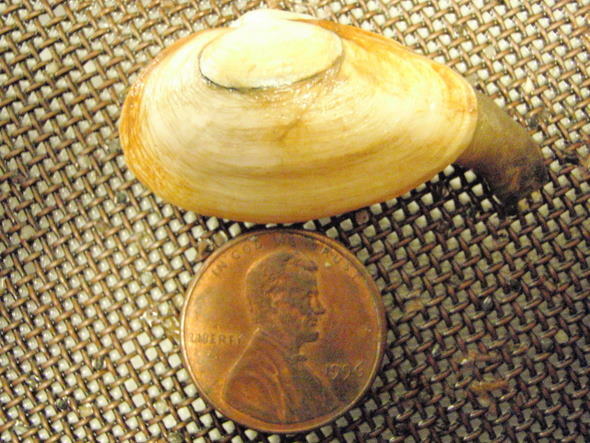 The difference between the two measurements equals the absolute growth of clams during the experiment. 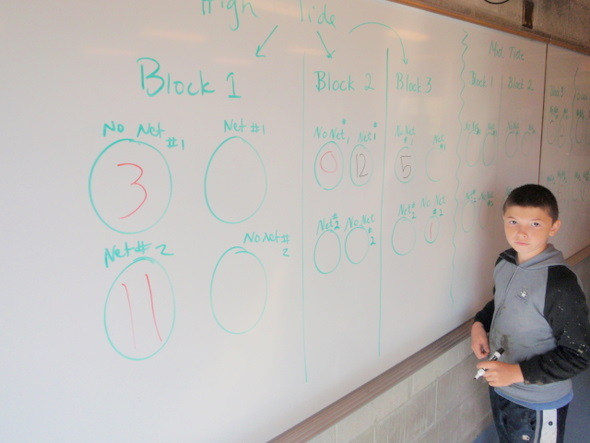 12) Measurements from each live clam were written on data sheets. One data sheet was used for each plant pot. All information contained on the label associated with each pot was transferred to each data sheet. 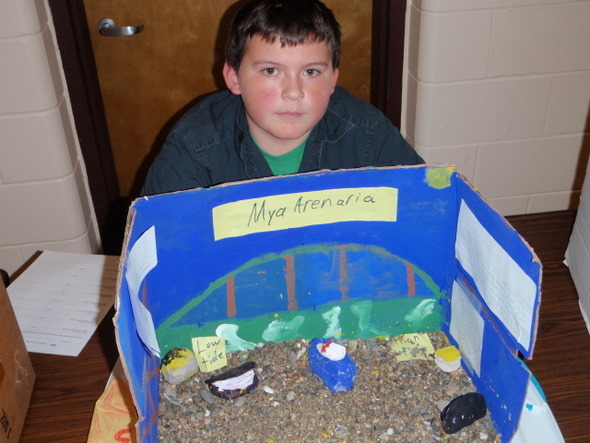 In addition, notes were made of dead clams, and whether they were crushed, drilled, or undamaged. 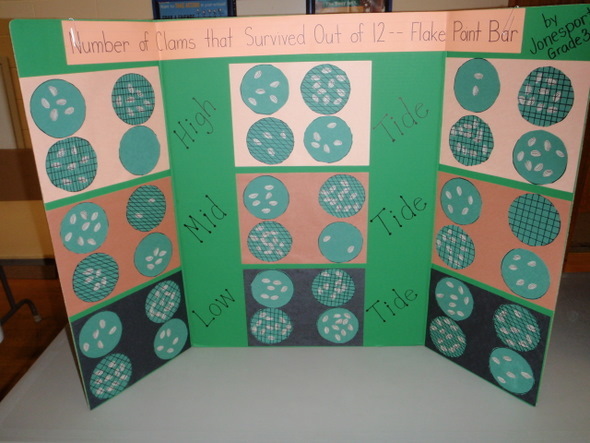 The data from each sheet was collated and survival results displayed directly on the board. 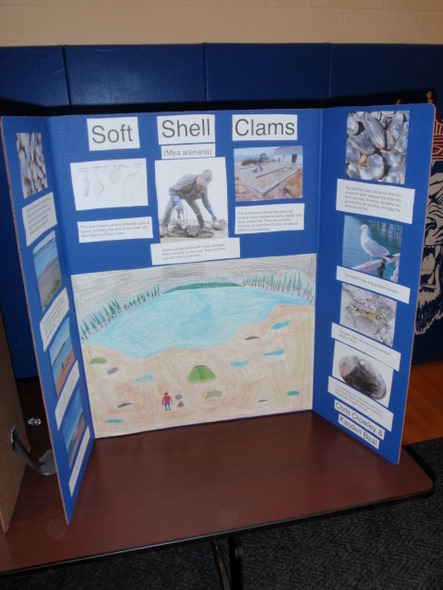 The local Bangor TV station (WABI) covered the Marine Science Festival. 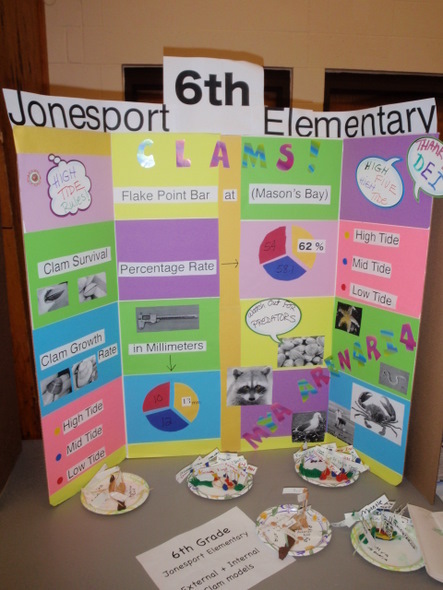 Gerald York, Jr., the music teacher at Beals Elementary, Jonesport Elementary School and Jonesport-Beals High School, wrote the music and lyrics to The Clam Song, a wonderful piece about the Clam Project that was sung by all Moosabec Community School District students at the Marine Science Festival.